Recently, MavenSocial conducted a user-generated campaign with Cold-FX, a Canadian company that specializes in natural remedies that help reduce colds and flu by boosting the immune system. They came to us because they wanted people to know they were Canadian (thumbs up!). Specifically, MavenSocial was asked to develop a social media program to acquire additional opt-ins for marketing purposes using engagement and sharing on various social media platforms. Our Cold-FX Fan Quiz Page – Oh Canada! This case study shows the importance of identifying and tracking your brand’s social media influencers, because they truly do influence the community space. d) understand the demographic make-up of opt-ins. 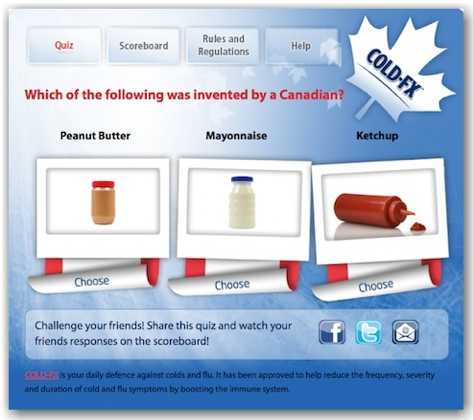 MavenSocial came up with the Cold-FX Interactive Quiz Campaign. We recommended a Facebook Quiz app with Canadian Trivia. Weekly trivia questions drove repeat visits and the leader board allowed visitors to challenge their friends to promote sharing. Manufactured by Afexa Life Sciences Inc. headquartered in Edmonton Alberta, Canada, the company and lead product was acquired by Valeant Pharmaceuticals International (headquartered in Mississauga, Ontario, Canada) in 2011. It is marketed as a daily supplement to improve the body’s immune system and aid in preventing common cold and flu, as well as a treatment to reduce the duration of the diseases. The results were amazing! Facebook ‘Likes’ doubled over the duration the campaign from 12K to 24K; creating great brand awareness for Cold-FX. There were also 10K new opt-ins, while 85,000 individual quiz/brand interactions were tracked with our database collection and tracking software. During this 60 day period paid clicks drove 14,100 visitors from Google and Facebook the remaining start-up traffic came from leveraging traffic from their existing site. The paid traffic brought in a lift of 809% and drove in 114, 106 visitors, 10,106 opt- ins. The top Influencer brought 64 new opt-ins, and there was a 541% Social Lift (FREE traffic and advertising through sharing) on Paid Media drivers. People definitely understood that Cold-FX is a Canadian company, learning it in a fun and interactive way. 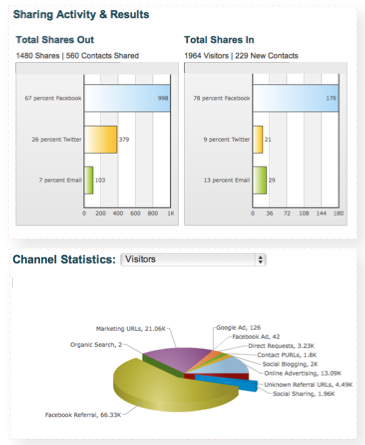 Brand Mavens helped to get the message out there through sharing with their community; which increased Social Lift.